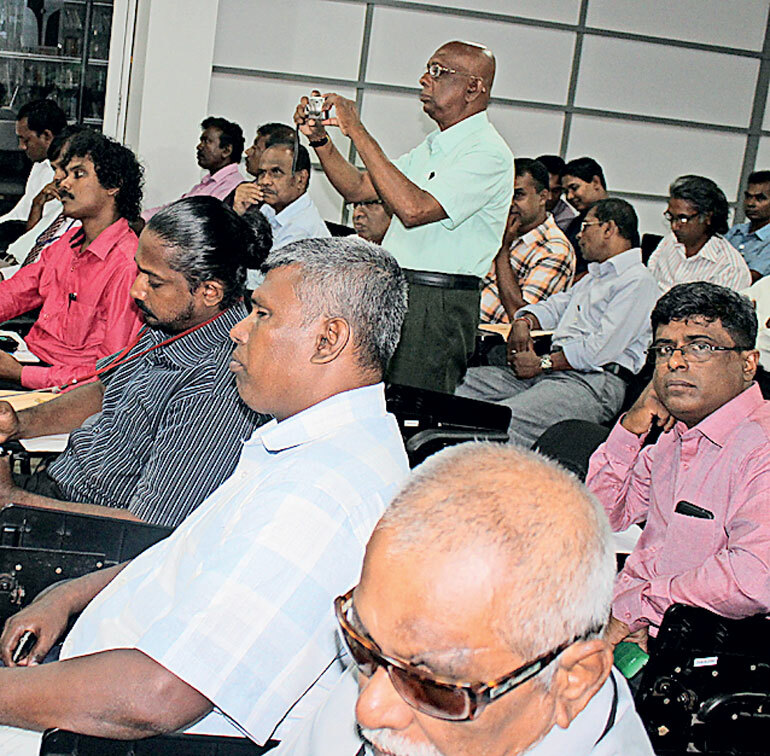 Three sensitisation workshops to advocate reconciliation-friendly media were organised in Colombo, Kandy and Kurunegala Districts for journalists by the Ministry of National Integration and Reconciliation. Over 150 journalists discussed the role of media in conflict transformation, reconciliation, and peace building. The Ministry under the direction of President Maithripala Sirisena has developed a Reconciliation Action Plan (RAP) in which reconciliation-friendly media has been identified as an important initiative. Globally it is acknowledged that the media has an important and strategic role to play in building national integration and peace building. At the workshop, the journalists identified that media can contribute to conflict transformation on one hand and also contribute to the escalation of conflict on the other hand. Discussions illustrated that media can make or break the peace, said V. Sivagnanasothy, Secretary, Ministry of National Integration and Reconciliation. The discussions by the journalists highlighted that based on the international experiences in Kenya, the media spread hate messages which created atrocities and led to genocides in early 1990s. Subsequently the Kenyan Government established a team to monitor hate-speech on social media. Such conflict barometers with a number of high-intensity conflicts helped to track the progress on peace building which helps journalists to report on the peace status of the country. Media influences to shape perceptions, condition behaviour and impact the minds, attitudes, emotions of readers and community at large. The journalists at the discussion pointed out that the cultural, ethnic and religious diversity be respected while fair and non-discriminatory reporting is a prime responsibility of the journalists. Journalists are “truth tellers” but media has a moral responsibility to promote reconciliation. Discipline in reporting on conflict-related issues were considered as important by many professionals. The workshop discussed that conflict-sensitive journalism focuses on democratic, pluralistic and just society. The peace journalism is where editors and reporters make choices about what to report and how to report – to create opportunities to value non-violent responses to conflict. The discussions highlighted that peace journalism is seen as a special mode of socially responsible journalism which contributes to peaceful settlement of conflicts. In this context, the participants discussed that journalists can be part of the solution rather than part of the problem. The role of journalists as a neutral disseminator is to be objective, impartial, integrity, ensure fairness, and balance in reporting. The journalists openly discussed that the professionalism of journalists gets eroded due to personal emotions, interest, prejudices, audience preference, lack of ethics, concern for being overly market oriented or economic oriented, influenced by negativism or influenced by elite groups or one-sidedness or social irresponsiveness and failure to look at diverse perspective. The journalists concluded the careful presentation of facts, reliable and varied sources, expert opinions, supporting documents, accurate quotations and fair representation of major viewpoints were vital for balanced journalism. The media helps to create political setting, policy setting and public opinion which help to bridge gap between perpetrators of conflict and victims. The sensitisation workshops concluded that the journalists’ professional responsibility of independence, objectivity, impartiality and truth telling and fairness were fundamental while social responsibility and public interest demands peace journalism and reconciliation friendly media that focuses on journalists being a part of the solution to the problem and help to build sustainable peace, harmony and national integration and reconciliation, said Sivagnanasothy. At the workshop the journalists also observed and endorsed the declaration on national integration and reconciliation which was initiated by the Ministry during the National Integration and Reconciliation Week declared by the Cabinet of Ministers in January. This workshop was attended by A.H.M. Fowzie, State Minister of National Integration and Reconciliation, Sivagnanasothy, Imtiaz Bakeer Markar, Chairman, Bakeer Markar Centre for National Unity and senior Government officials, several journalists and academics. The workshop was conducted by the Ministry with the support of Bakeer Markar Centre for National Unity and academics. The journalists acknowledged that the media could effectively contribute to the reconciliation and peace building process and the sensitisation program significantly contributed to this process.